Home » Technology » Computer Access. Forward / Back Button: The side of the mouse contains a Forward and Back Button for quick and easy internet navigation, The 3 color LED lights lets you choose your backlit color with a touch of a button and to suit your personal preference and mood, The Optical sensor technology keeps the device precisely on point and lets you work on most of glass, wood, marble and leather surfaces without needing a mouse pad, Featuring a Green, Blue and Red 3 color illuminating lighting with 800, 1200, 1600, and 2400. USB Micro receiver, with 2.4 GHz for wireless freedom up to 33 ft., Windows, and Mac compatible. USB input to a computer, with 1000 dpi, as well as a modern shape and feel, with a lightweight body. 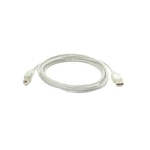 USB 2.0 A-B 6 ft. cable.